Prospective Randomized Comparison of Conventional Lictenstein Versus Self-Adhesive Mesh Repair for Inguinal Hernia. Inguinal hernia repair is one of the most common procedures performed during surgical practice. New methods and materials are introduced for a better outcome for this procedure as well as a better quality of life and postoperative period. This study compares conventional Lichtenstein hernia repair with sutureless self-adhesive mesh repair in terms of operative time, postoperative pain, hospital stay, complications and cost. Conventional Lichtenstein and self-adhesive mesh repair were performed in two groups of 24 groin hernia patients. The difference in operative times between groups was statistically significant. Mean pain scores (Visual Analog Score) for the conventional Lichtenstein group was significantly higher than the self-adhesive mesh group at and after 12 hours. Although the first group required a higher dosage of analgesia, the difference was not statistically significant. There was no recurrence in either group during a mean follow-up period of 9 months. Although the cost analysis of the techniques revealed a higher operational cost for the self-adhesive repair, it is too early to talk about an overall high expense of this new material before the long term results of the material. 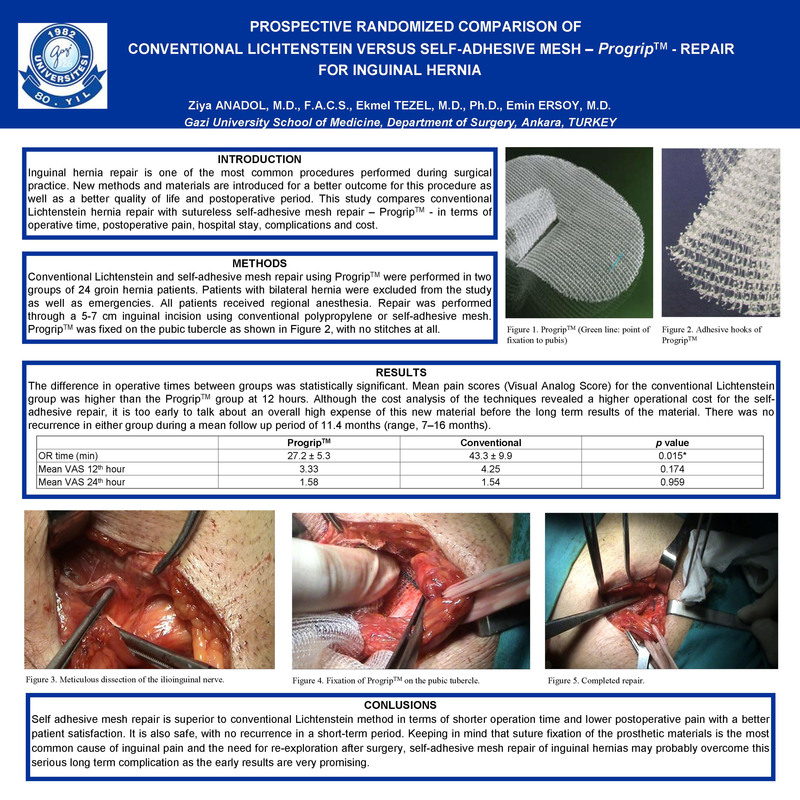 Keeping in mind that suture fixation of the prosthetic materials is the most common cause of inguinal pain and the need for re-exploration after surgery, self-adhesive mesh repair of inguinal hernias may probably overcome this serious long term complication as the early results are very promising.